My first time to Africa is also the FIFA world cup’s first visit to Africa. Football fans in their hundreds flocked to the Logos Hope to watch the world cup on our big screen in the Hope Theatre. During half time, Logos Hope crew members interacted with the crowd using simple games and testimonies to communicate the Gospel. 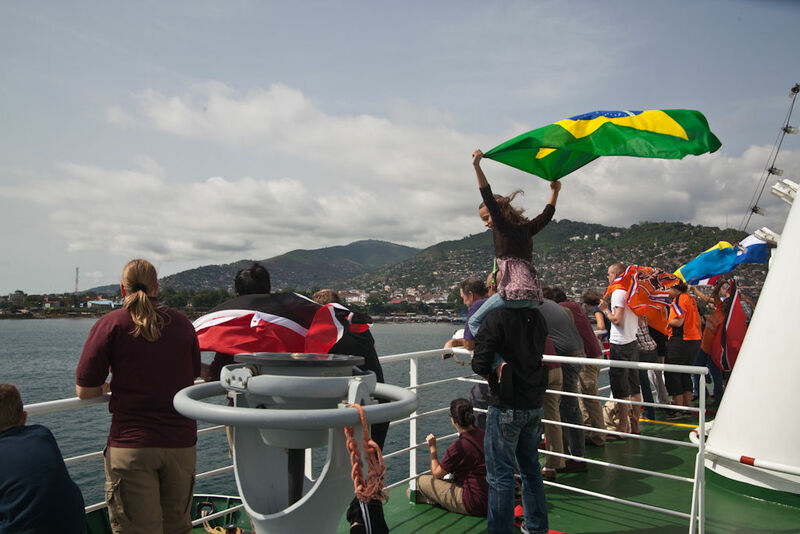 The world cup proved to be a stressful time for me as the technical challenges involved in getting satellite TV coverage on board a ship seemed almost insurmountable, but with prayer and a little faith the coverage was achieved. Satellite TV however is not invincible, and in one match shown on board with only 10 minutes remaining a heavy rainstorm set in outside, completely obliterating our TV signal. 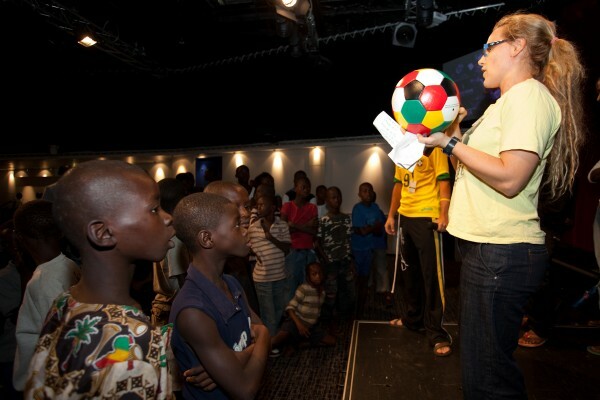 Many people stayed in the hopes the signal would improve and while they waited for the signal to come back on Cherith took the opportunity to explain the Gospel using the coloured football pictured. Gold reminds us of heaven where God lives, and God is perfect. The dark patch reminds us of sin, the selfish acts that our perfect God will not abide with. Red reminds us of the blood of Jesus – the payment for our sin, so we can be friends with God again. White reminds us that we are purified from our sin and are called to live a righteous lives. And Green reminds us that we are a new creation. Sitting on a bench beside a dirt road in Africa surrounded by curious locals, I began to tell my testimony. Some of them only speak Creole, so every sentance needs to be translated and every response translated back again. Many local people had crouded around this odd looking white fellow figuring he must have something important to say. After telling them about Australia, I told them of a time that I called out to God before I even called myself a Christian and He sent my Dad to rescue me. Then I shared the Gospel with them. Everyone was very interested to hear what I had to say, even if they didn’t agree. I remember I was so out of my depth and if I had time to think about it I would have been scared, but God carried me through it and gave me the words to say. Though none of these people accepted Christ there and then, many said they would come to the evening programme at the local church. As part of an e-day team I was paired with a local Christian lady who led me around the village introducing me to people and translating for me. Everyone was quite happy to invite me into their home to sit down – as I recall none of them had doors, yet we still called it door to door ministry. We also had the goal of inviting people to an evening program at the church which other ship people will share testimonies and preach. I had the opportunity to challenge one man to go back to church, since he had been going to church but stopped lately. Annother woman said she would like to pray with us, so my friend and translator prayed with her. 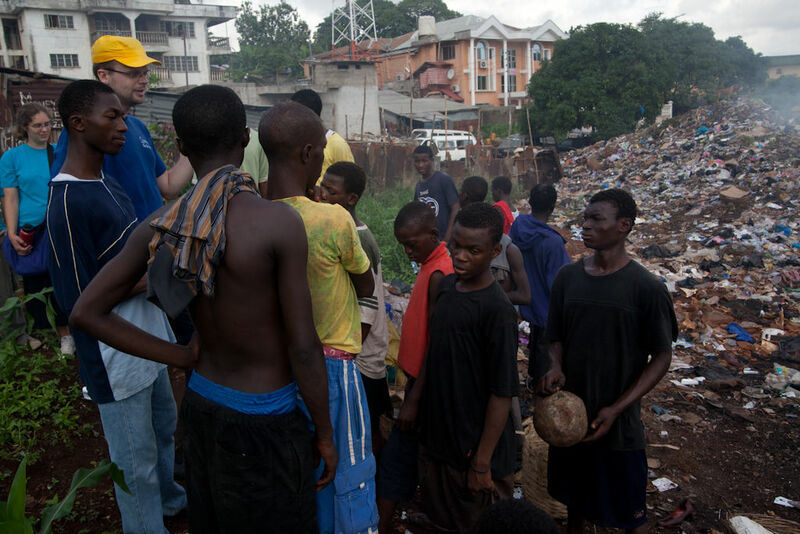 It sure is an amazing experience talking to African people – they actually want to hear about Jesus. Thankyou God for this amazing day. Ocean in front, ocean behind, ocean to the left and ocean to the right. For 12 days the Logos Hope – my home on the sea – will sail from the Caribbean to West Africa. Anyone who knows me knows that I can be motion sick in just about anything that moves – cars, planes, busses, trams – and a ship is no different. You can’t stop the ship to get out and rest – you just have to keep going. Often I have been seasick for days as my home moves from country to country. One day a collegue of mine challenged me, she said that if I believe and trust God then he will help me to stay well despite the raging seas. I was unwilling to believe her there and then, but as I thought about it it did seem like something God would do – obviously I would be more useful to Him if I was not seasick. So this time I prayed (and I believe a lot of people prayed with me) that I would be well for the journey – and to no surprise I have been perfectly fine so far. –Update: I have not been seasick for the entire 12 days– So it goes to show that God can use you even if you think that you are useless. The Atlantic crossing has so far been an amazing experience. We have had a Caribbean reflection day where we gave God glory for what he did in the Caribbean and then we each found a place to be quiet and reflect on our time there. We get to experience a little of each other’s culture through evening programmes and special dinners. I am looking forward to the Japanese Experience. Last night at midnight the Logos Hope – My home – left the last island in the Caribbean on our schedule – Roseau, Dominica. The Caribbean has been my home for 8 months now, though the Logos Hope is where I spend most of my time so every time I walk out the door I experience some culture shock. If I were to use only one word to describe my experience of Caribbean people – I would say alive. Alive in a way that European and even Australian people can be dead. People want to talk to you, to say good morning to you as you pass in the street. People are not afraid to ask you spiritual questions. In this way they are friendly, but in another way they can be rude. Sometimes the staff in the book fair struggled to deal with the demands of insistant customers who asked for discounts, demanded service and rarely smiled or said ‘hello’. Christians here are not afraid to spread the Gospel – and I have learned a little boldness from them. The nations I visited gain their income from tourism, hosting wealthy white tourists on sandy beaches – while their populace often live in abject poverty. The contrast is frightening to me, and it scares me that the tourists don’t see the poverty as they are wisked away from their cruise ships in a taxi to a nice beach. In the Caribbean I spoke in front of another church body for the first time, handed out gospels on the street for the first time, performed an evangelistic drama for non christians for the first time, told a story to a group of kids for the first time, and started really trying to talk about Jesus one on one with stranges in the cafe. I have become accustomed to introducing myself as Chris from Australia – the land of Crocodiles and Koalas and Kangaroos. I have learned the hard way how to lead a team with love and patience – and discovered in me and weeded out a competitive spirit that doesn’t support the body of Christ. The Caribbean has been a special time for me, and I will never forget it.